You can easily see the total value of all your blockchain assets by clicking on Portfolio. There you will see a visual breakdown of your percentage of each blockchain asset. You can toggle between fiat value and BTC value by clicking on the value. 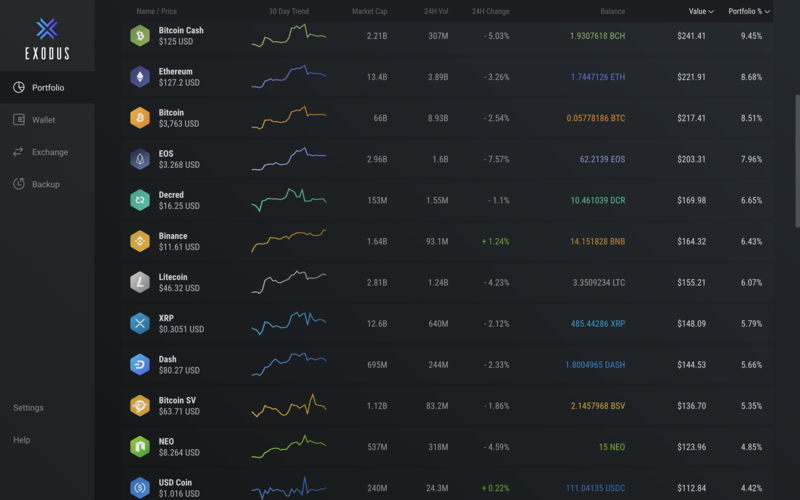 Under the chart, you can see the total balance of each blockchain asset along with the percentage of holdings, 30-day trendline, market price per asset, market cap, 24-hour volume, 24-hour change, and the total value of your holding. How does Exodus calculate transaction fees?